He says the unicorn’s horn is pointing the wrong way. It’s a problem he points out with several other unicorn sculptures in his museum. Brown came to Jacksonville from Kentucky in the late 1970s and for years ran a pharmacy in Springfield. 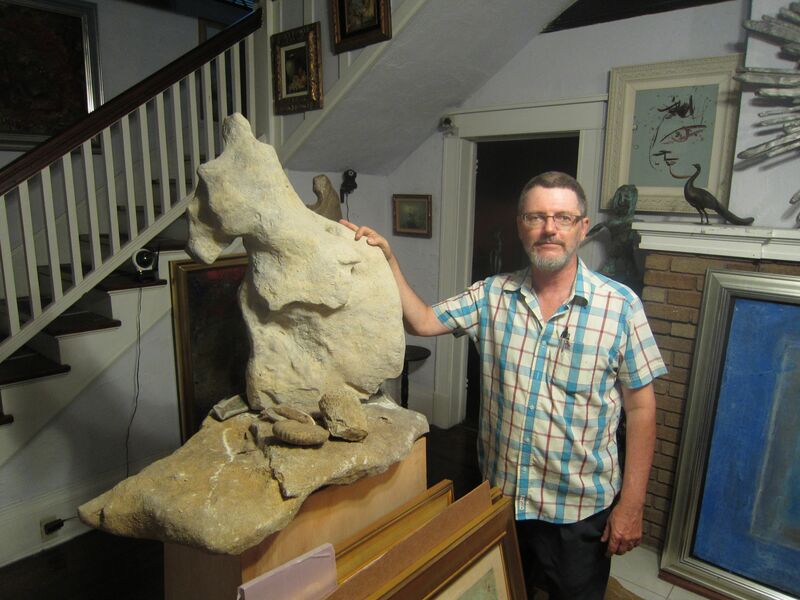 He began collecting art a couple decades ago and his art collecting gradually ate up his time for the pharmacy. 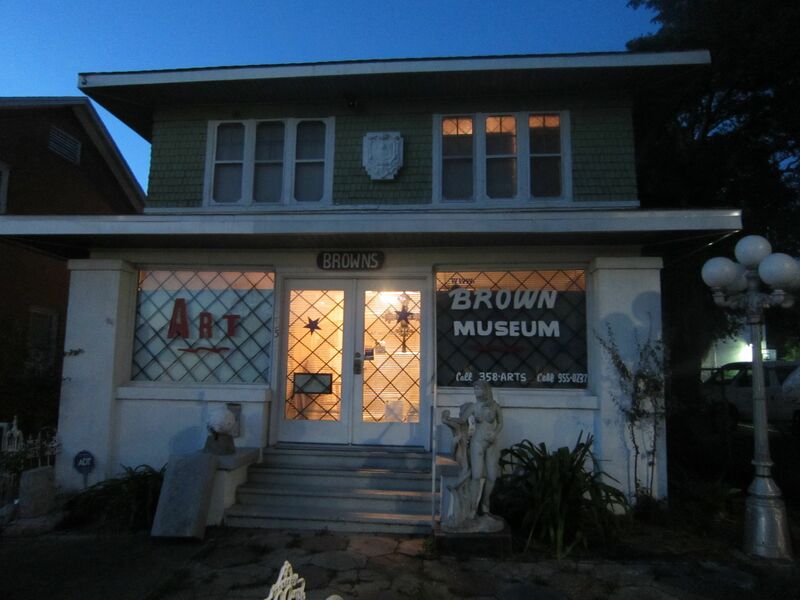 So now, in the early fall of 2013, the pharmacy is gone, and Brown’s 1500 pieces of art are housed in this old house and two other Springfield locations. That particular artist happens to be Jamali, an Indian-American painter based in Orlando, who’s sold his “mystical expressionism” to collectors around the world. Brown seems to have more of Jamali’s works than of any other artist. 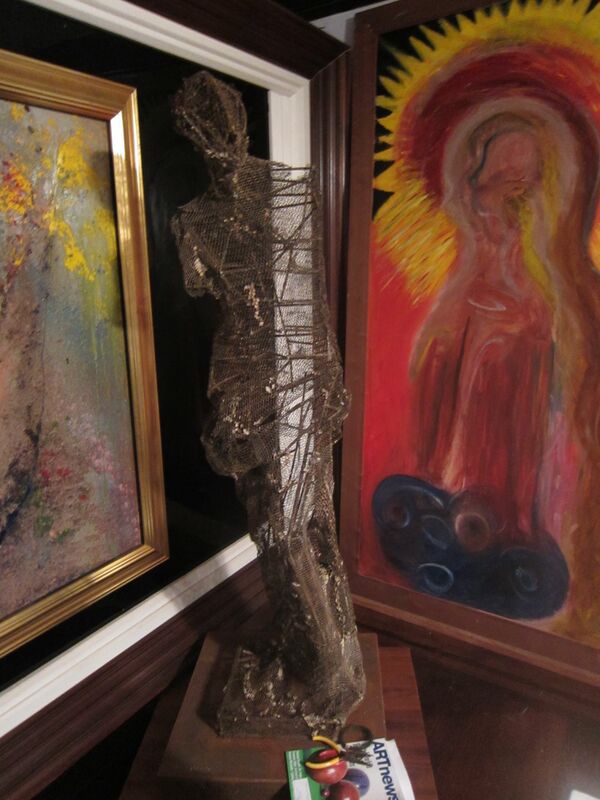 I’d been thinking “outsider art” ever since I saw the tall-as-me Venus de Milo made of chicken wire downstairs. I’ve long loved the idea of outsider art, art created by people with little formal education and no artistic training, because it implies the incredible creative potential of people with nothing but vision and obsession. Outsider art seems pure compared to the ultra-self-conscious irony of much of the contemporary art world. So Simon Rodia, an Italian immigrant laborer who barely spoke English, built the Watts Towers in Los Angeles, using scrap iron and tile and concrete and broken bottles. He worked on the towers for 33 years, until there were 17 towers and the tallest reached 99 feet from the ground. 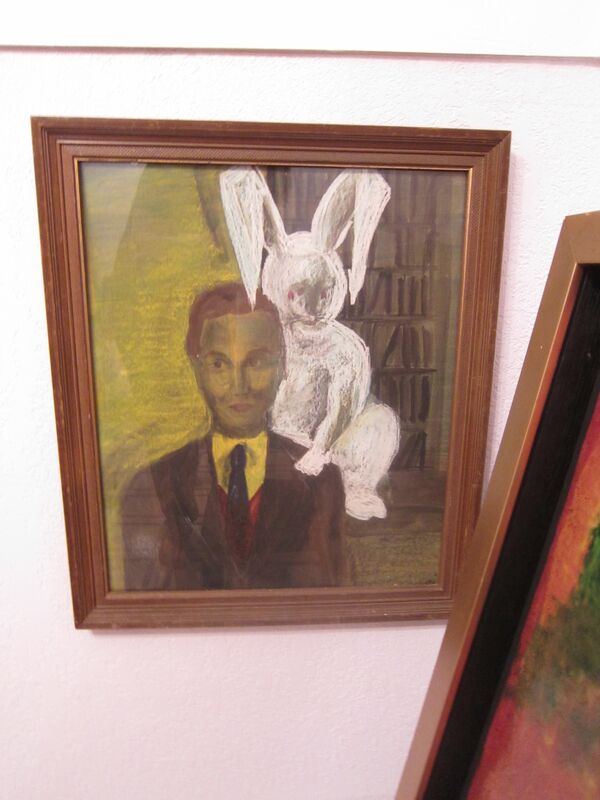 But many outsider artists focus on religious and mystical themes, apocalyptical battles between good and evil, and many have apparently suffered from various mental illnesses. These elements have further defined outsider art from the larger category of folk art. So Howard Finster built Paradise Garden outside Athens, Georgia, a series of sculptural works and surreal architecture, infused throughout with Finster’s paintings. Finster built the garden from everything from bike frames to old building materials to bathroom accessories. He created something like 46,000 works of art, most with messages including Biblical prophecies, apocalyptic warnings, even connections between mysterious scriptural passages and UFO’s. 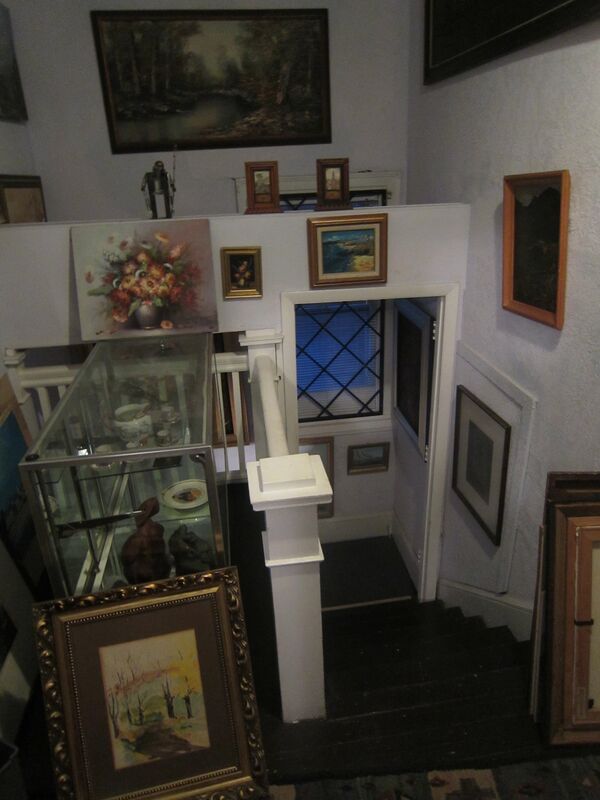 Standing on a beautifully curved semicircular second-floor landing beside a tall open space from the ground floor to the attic above the second floor, Brown points to the Spirit. 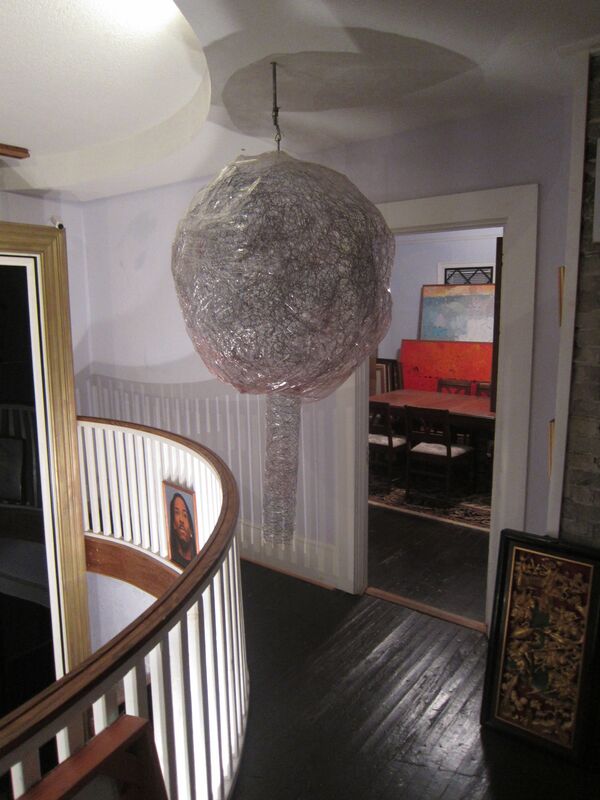 The Spirit is an enormous ball of chicken wire covered in cellophane that depends from the ceiling at the edge of the balcony. A painting Brown says is of a young Snoop Dogg hangs from the railing underneath. Brown apologizes for the Spirit, says it’s not very good, but I find something beautiful in its simplicity of materials and idea and what it does to the light on the ceiling and the walls and the floorboards. He tells my daughter Veda not to stand behind the Spirit when I snap a photograph or she’ll be the Spirit in the picture. Though Brown created the Spirit and cast molds for several other pieces in the museum, including some of the unicorn busts, he waves a dismissive hand at me when I ask him if he’s an artist. 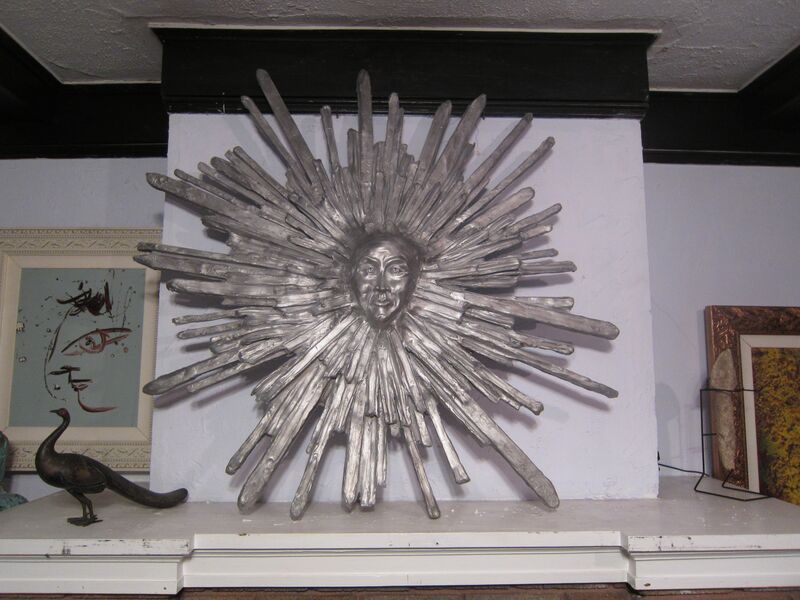 Clearly he creates, and perhaps couldn’t help but create when constantly immersed in the trade of outsider art, but he defines himself as art dealer and collector. He downplays his connections, but he’s just returned from Atlanta with several acquisitions and he speaks of setting up at an upcoming show in Miami. 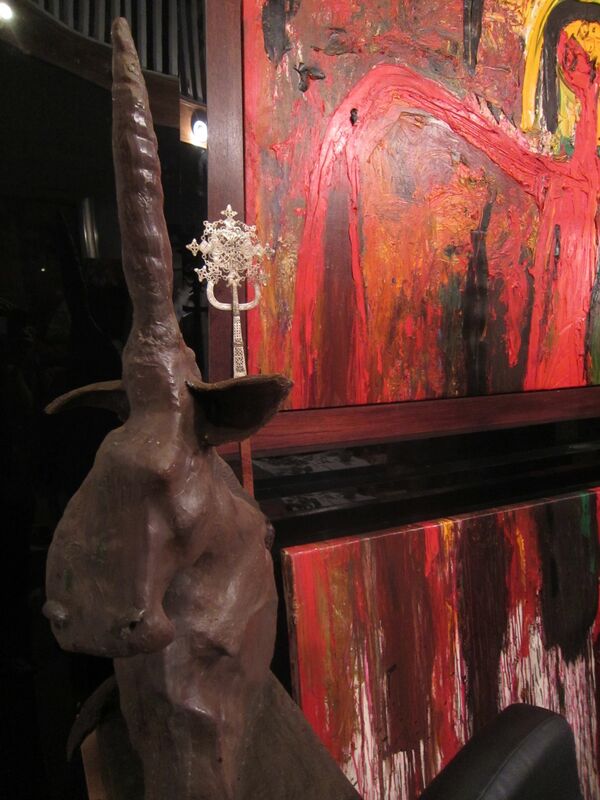 I wonder if Phillip Brown is Jacksonville’s nexus in outsider art. He points to a number of famous artists’ paintings that cannot be authenticated. 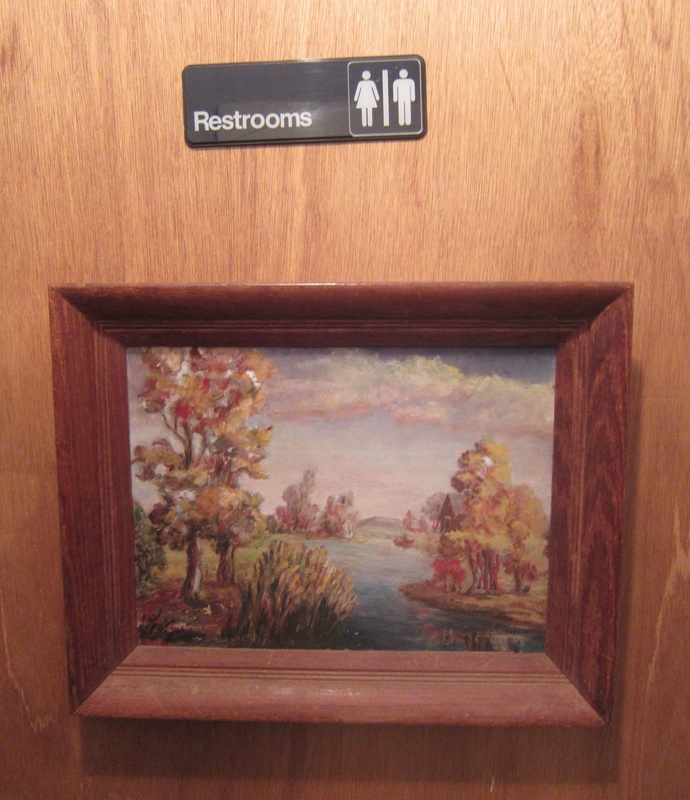 There’s an unauthenticated Picasso, an unauthenticated Van Gogh, and an unauthenticated Renoir on the bathroom door beneath a unisex restroom sign. Brown once told a reporter that if he could just sell his Winslow Homer, he could make a few million dollars. 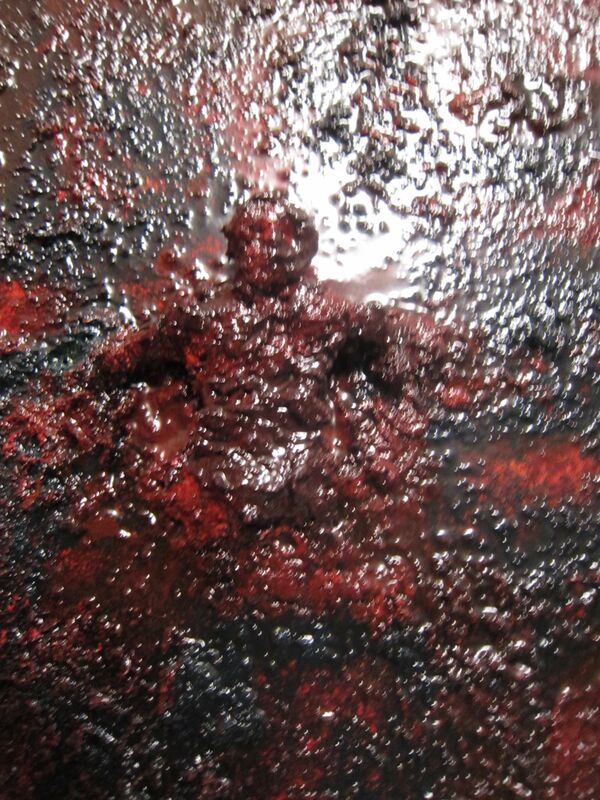 “That’s St. Croix’s self-portrait. You can tell a lot about a person by the self-portrait,” then returns to his idea that Jamali’s self-portraits and other works indicate evil spirits, which he repeatedly connects to Jamali’s being Muslim. If anything, Jamali’s spirituality seems pantheistic, not Christian or Muslim, and my daughter and I have to try to see evil spirits in good, or honestly, either kind of spirit at all. Brown shows us several more paintings by Jamali, including paintings he says were supposed to indicate Christ, but “got it wrong.” In one painting of Christ, he says, Brown saw the Devil, so he had to cut the Devil out. 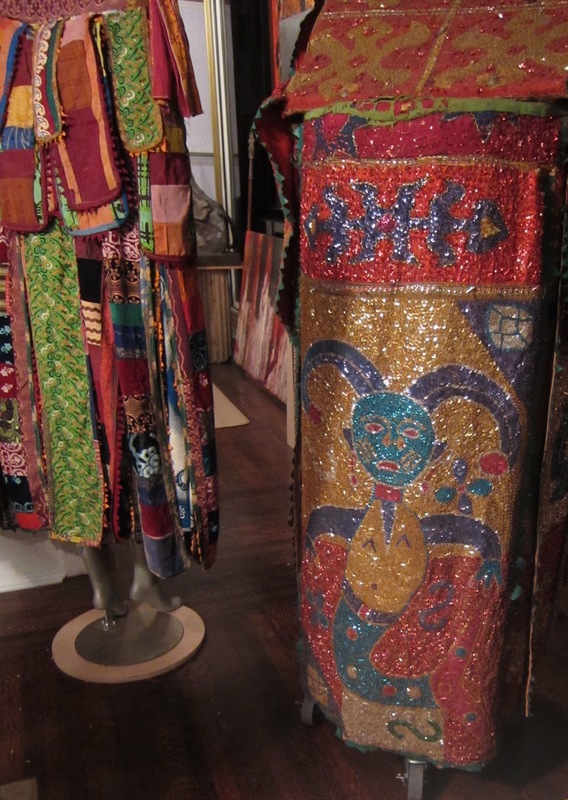 Coming downstairs, he points to a series of costumes he says are “very old” from the Ibos of Nigeria. They’re beautiful, blue and purple and green and yellow and red, and they sparkle and spangle even in the light inside this old house at night. As he walked us front rooms to back, then up the staircase on one side of the house, across the upstairs balcony, through landings, small rooms, and closets packed with paintings, then down the staircase on the other side of the house, he had mentioned the 13th tribe, the lost tribe of Israel, several times. The Bible refers to the 12 tribes of Israel, but some medieval and alchemical texts made reference to a “lost” 13th tribe. Some apocryphal texts refer to multiple lost tribes. The ancient Ethiopian capitol of Axum presently claims to guard the Old Testament “Ark of the Covenant” and to be the city from which the Queen of Sheba visited King Solomon in ancient Jerusalem. But these African costumes, Brown claims, are Ibo, though he also mentions the Yoruba, and it’s true some members of both Nigerian tribes claim lineage from ancient Israel. As outsider art collector and perhaps, though he would disagree, outsider artist himself, Phillip Brown has a large and vested interest in the African Lost Tribe(s) of Israel. By virtue of being lost, these tribes are outsiders and deserve praise for not only keeping the faith, but channeling it into their own distinct directions. 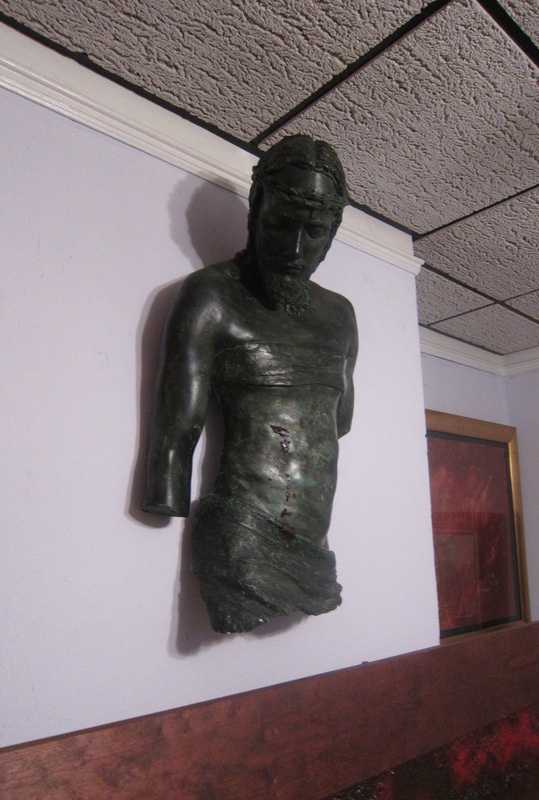 He shows us several paintings and small sculptures by Jacksonville artist Shaneka Johnson. He indicates several “street artists” whose original works Johnson developed further, collaboratively. One of Johnson’s paintings boils with red, and small figures seem to break through in different places. The overall theme is crucifixion. Brown points to the “white part” of the painting, in the shape of a cross, where Christ’s purity comes through the blood. Talking to Phillip Brown was an accident. I drove by beautiful old Victorian homes in Springfield, the Jacksonville neighborhood just north of downtown. We stopped at Sweet Pete’s candy store in the tall old house on North Pearl Street. I bought Veda a blueberry soda and a couple pieces of dark chocolate. I drove down Pearl to West 8th Street, and just as the sky had turned its blue toward black, we saw Phillip Brown unloading his truck. We had no idea we’d find Jacksonville’s center of outsider art, evil spirits posing within good, the 13th tribe of Israel, and the Black Mermaid. 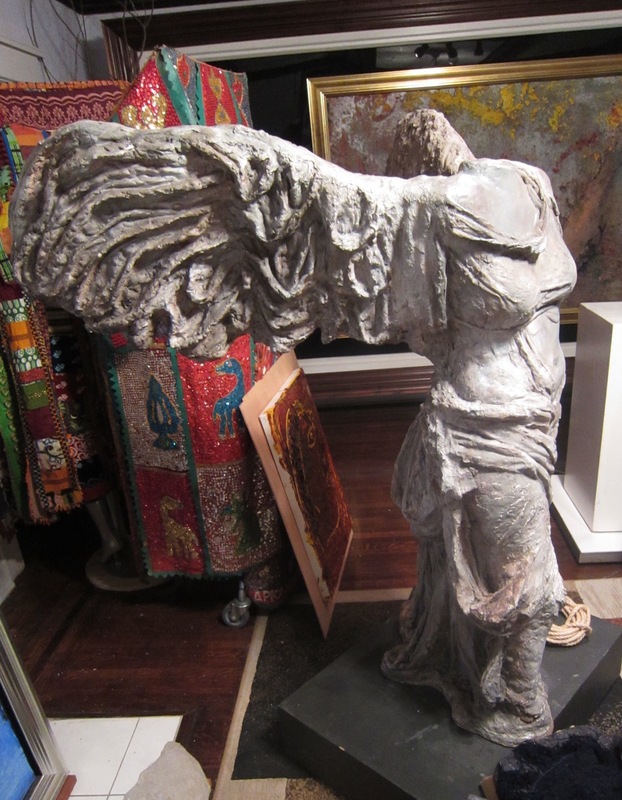 But I’ve found that collecting is itself an art, and that Phillip Brown, collector and trader of outsider art, has created a great work of art at 335 West 8th Street. 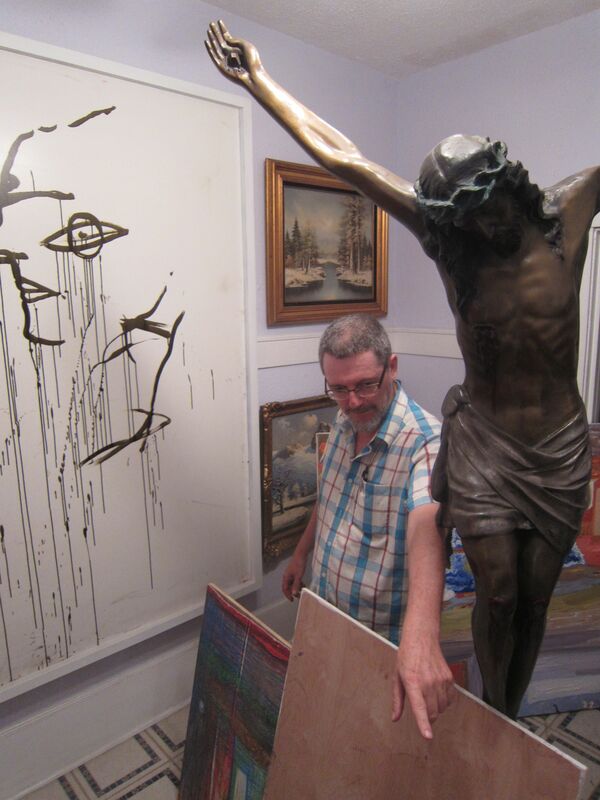 He deserves recognition as one of this city’s primary outsider artists.